In the January edition of Entrepreneur Magazine, there’s a story titled “Would You Open Your Books?” (p 20). I pitched that story to the editor six months prior. My first pitch to him failed. The second one got featured in the magazine. This article shares why my second pitch got featured while the first flopped. If you are an entrepreneur, a PR person, or a growth hacker looking to get the attention of press, this article explains what you need to know to get your story featured by media outlets. I was sitting at a large conference table with nine other people. To my left was Jason Feifer, Editor-in-Chief of Entrepreneur Magazine. Jason was the star of this breakout session. Essentially, if anyone knows about media, it’s him. He has worked for The NY Times, Washington Post, GQ, Slate, ESPN, and more. And now as the Editor-in-Chief of Entrepreneur, he’s responsible for selecting the stories that ‘make the cut’ into the magazine each month. 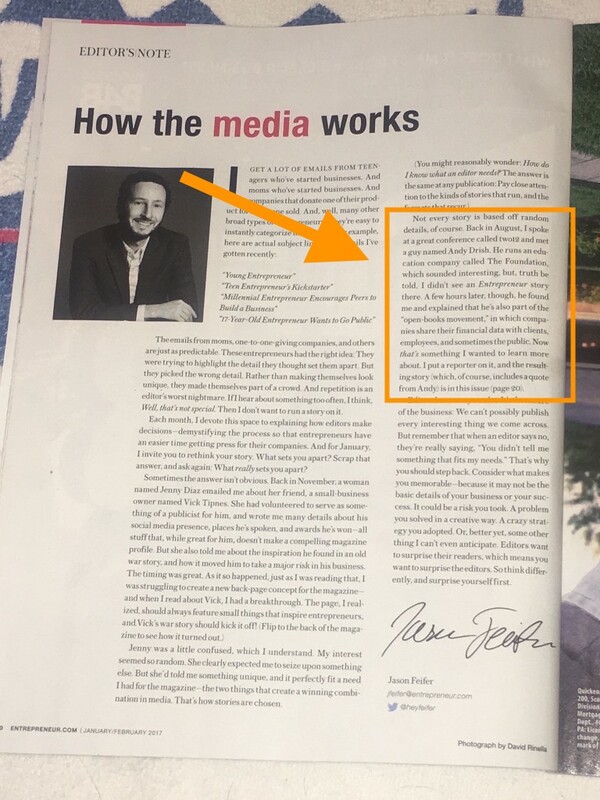 One feature in his magazine could be worth tens of thousands of dollars to a company. So every day he fields hundreds of spammy cold emails from overly-ambitious entrepreneurs, startups, and PR companies all trying to steal his attention and get a featured article. We were gathered around him at the conference table like children at a campfire, waiting to hear his sage wisdom, his stories, and his ideas on doing PR right. “There are two approaches that never work for getting press. The first strategy everybody tries and it always fails… assigning your PR role to an intern. Entrepreneurs do this because they don’t have a clue how to pitch media and they think and intern can figure it out. This is the worst. Don’t waste your time or energy with this approach. “The problem is, people don’t think like an editor. They’re stuck thinking about their own business. The truth is, we’re not interested in your business. We’re interested in stories that captivate people. We’re interested in covering what’s new, hot, and story-worthy. The more you can start thinking like an editor and tie your story into a current trend or something fascinating already happening in the market, the more likely you are to get my attention. That was when it ‘clicked’ for me. I always thought about my business first and the ‘story’ second. Lesson One: Discover ‘the story’ happening in the world first. Then decide how your business fits into it. I was impressed with Jason’s insight. But it didn’t give me the answer I was looking for. “I’m curious what email subject lines you open versus ones you immediately delete. The room became charged with anticipation. The greedy marketers were salivating at the prospect of learning what subject lines actually captivate someone as busy as Jason. He pulled out his phone and started scrolling. Almost all of them were written directly to him. No mass email list. No vague subject line. They were written specifically and directly to him. Anything else was deleted… almost immediately. Think about it: Imagine getting literally hundreds of emails clouding your inbox every single day all from people who want something from you. He HAS to filter quickly for what’s personal. In one email, a person wrote a sincere personal pitch and asked for feedback because he wasn’t getting results. First, by his generosity. And second, by the psychology of how I could use this as a strategy. If you send a truly personal pitch and include some sort of PS asking for feedback, you’ll likely increase your odds of getting a response. And they might tell you exactly what you need to say for your next pitch to land. Again… Genius. This session was really paying off. But what’s even better is what Jason shared next. It was an email from someone who met Jason at a conference a few years back. He was following up and sharing a pitch that was relevant now. Jason treats his personal network and contacts with an incredible amount of respect, so he always wants to respond to people he’s met in person. That’s why this subject line works almost every time. File that away in your memory bank for future emails. We finished our hourlong breakout session, and as we were shuffling out of the room, I tried to soft-pitch Jason. “I run a company called The Foundation, we help entrepreneurs get started in business. We’ve had all sorts of businesses be spawned from our little accelerator and many people have quit their jobs, are traveling the world, and are doing work they love now. Last year I made friends with a writer at Business Insider who featured a handful of our Foundation students in articles using this same angle. I thought it’d work for Entrepreneur, too. I spent the next few hours going over my notes and brainstorming different ideas and angles. 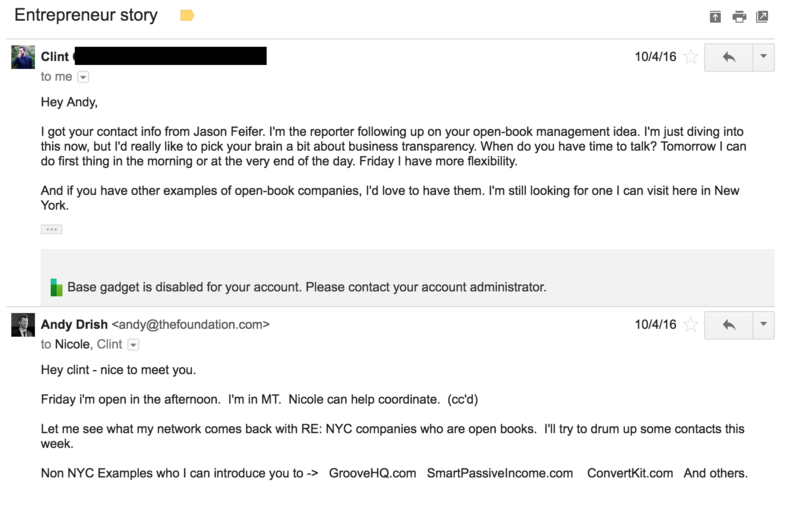 If I couldn’t successfully make a pitch to Jason in person, how could I possibly succeed over email? I finally thought of a story worth pitching and, before the final keynote of the day, I noticed Jason sitting at a table. 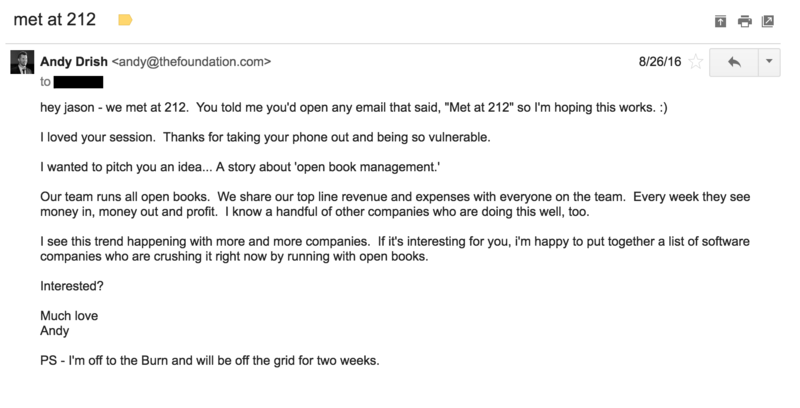 “’Open books’ is a management philosophy where you share your revenue and expenses with your employees so everyone knows how much money is coming in and out of the business. Less than 5% of companies are open books, but the ones that are consistently tend to perform better. And, as the world trends towards more transparency, we’re seeing more businesses use this like Buffer, ConvertKit, Smart Passive Income, Entrepreneur On Fire, Groove and more. Notice the difference in my pitches? The first pitch still focused on my company. Not the overall trends in business. The second pitch, I focused on a trend already happening among many companies. And I shared how I fit into that trend. That made all the difference. But it didn’t seal the deal. After I got Jason’s attention and permission to follow up, the follow up began. As expected, it got a quick response. I ended up in a private Facebook group with Jason for the 212 alumni. He asked for feedback on cover variations of Entrepreneur magazine. After sharing my thoughts, it gave me the perfect window to ask for a quick follow up. A few weeks later, a reporter reached out to me. We scheduled a Skype call and he grilled me with questions and asked for introductions to other businesses. A side benefit of pitching stories to reporters is that you can also get your friends featured like Alex from Groove, Pat from SPI, and Nathan from ConvertKit. Clint and I hopped on Skype and I told him everything I knew about open books, who was doing it and how he could learn more. A few months later, the story ran in Entrepreneur Magazine. From nothing. To bombing a pitch. To getting his attention. Following up. Getting interviewed. And watching the story go live. 1) Think Like An Editor And Pitch “The Story” Before Pitching Your Business – No editor cares about you, or your business, or your next big idea. They care about stories that captivate, entertain, and show trends. Don’t focus on pitching your business. Focus on pitching trends that are happening in the world and then show how your business fits into that trend. 2) Know The Values Of The Publication – Different publications value different things. Business Insider ran features on our students because they valued running a series of articles about entrepreneurs who quit their job to travel the world and are making money following ideas they love. Our stories were a perfect fit for Business Insider. But that idea didn’t fly with Entrepreneur. Know your audience. Know what they value by studying the types of articles that get the most traction on their site. 3) Write Emails Specifically To Each Journalist – If you write one email to multiple people, you have a VERY small chance of getting any response. This isn’t the place to try ‘the shotgun approach.’ Instead, be a sniper. Focus on a smaller group of people but laser in your messages so they’re personal and entertaining. The more personal, and the more you can show you’ve done your research by knowing what stories click with their audience, the more likely you’ll get a response. 4) Always Follow Up – 90% of people never actually follow up and almost always lose opportunities because of it. People are busy. Ideas slip through the cracks. Following up is useful to a busy person. I love it when people circle back with me. Especially if I asked them to. I followed up with Jason three times over a period of months before the article went live. Be patient. But always follow up. 5) If Your Pitch Isn’t Working, Genuinely Ask For Feedback – If you’re trying your pitch and getting nowhere, ask for feedback. Ask people how you can make the pitch better or what would be more aligned with their audience. This doesn’t work if you’re blasting the world with spam messages. But if do your research, write personal emails, and still get no response, try sending a follow up and asking why not. You might be surprised at how generous people are with their thoughts. If you found this story valuable, I’d love it if you gave it a share on Facebook or Twitter.